Custards are a pretty, delicious base for any jam, any topping. I've made these kefir custards before as a solo act -- the custard and thick cookie base creamy enough to satisfy my Winter craving for something fatty and sweet and homemade. But these can be made in many incarnations -- with cinnamon instead of (or in addition to) vanilla bean, scented with rose or lavender or lemon, topped with apple or pear or pumpkin butter, or of course blackberry jam. I can see this being a friendly addition to the Thanksgiving table topped with caramel and pecans. 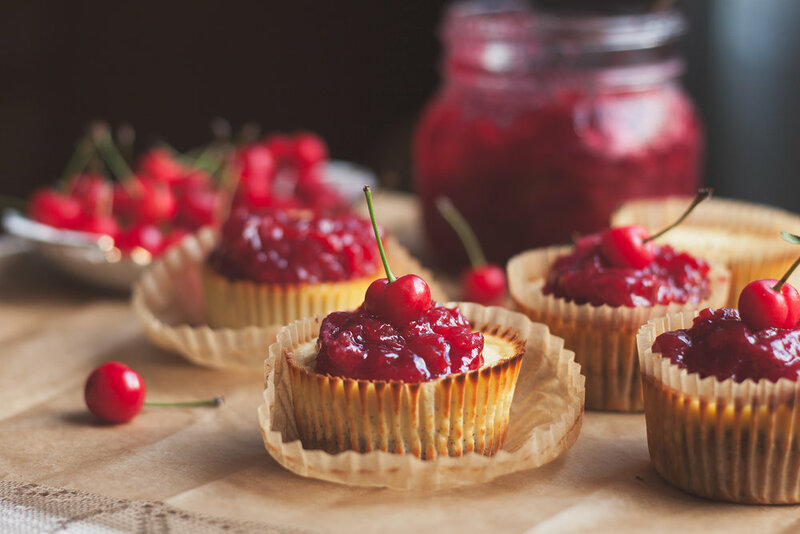 The cherry jam topper is welcome at Fourth of July festivities. I might even do half blueberry and half cherry jam for that one. This is a dessert for all seasons, in my humble opinion. I'm a new convert to kefir. I put it in my smoothies instead of yogurt, in my cakes instead of sour cream. Mostly I put it in my mouth. With some honey. It's delicious, and drinkable. I dig that. But it also makes these really delicious little custards, which I discovered by accident a while back when I ran out of goat cheese for a cheesecake. I liked the result of these even better than my cheesecake dreams. I use (almost raw) goat milk kefir. It's tangy, and I'm pretty into the nutritional profile. You won't get badass probiotics out of these custards (because heat + probiotics = no more probiotics). But you will get tons of calcium and protein. Did I mention these custards are cane sugar free? They're sweetened with maple syrup and honey, which break down slower in your system -- so you won't get that crazy sugar high as you might from most desserts. You can use a sugar free jam as the topper, as well. My yard is essentially a tangle of green things interspersed with berry bushes, flowering lilies and trees over laden with fruit. Most of the fruit trees are just flowering now or have only begun to hang with tiny green versions of what will someday be persimmons or dates. The kiwis are so virile I feel I'm silently warring with the whips of new growth -- like tentacles wrapping around gates, like fingers clasping with the grape vines in a fist. There are fans of brown switches leaved in soft green shooting out in a desperate grasp towards the sun. Brambles of blackberries have sunk in over top of one of the chain link fences. It's a bunker, a blackberry fortress, each year the new leafing out on top of the old. It thickens and becomes home to song birds and groundhogs and other small creatures of the city. Chickadees, mostly, I imagine. And beyond the blackberry thicket, a pocket of raspberries -- intentionally planted in a small plot, but hanging, rather flattened by the winter. Blueberries ripen gently and full of spirit -- each of the six bushes a different variety. It's like watching sextuplets, each with a different personality and slightly different face, mature and express his or herself. There's the first of the season, with just a few berries hanging in big dollops of 6. They're fat berries, sugar sweet. But you only get a handful before it's done. From there, throughout the Summer, the berries ripen from right to left. Some bushes are dripping with berries, like blueberry chandeliers. Others are stock and upright, holding their as-of-yet green blueberries (or huckleberries) with a diligent, upright attitude. The cherry tree is exuberant. She's loud and tangy and tells everyone when she's ripe. And every fruit is ripe at the same time. Bright red orbs swinging in the wind, I feel almost as if it should make chiming sounds as the fruits knock together. Clear and bright and harmonious. Little fruit bells. When you pull them off of their stems, they often squish right into your hand -- the pit still hanging on the tree. The sun practically bakes them as they bob, so they're hot when they hit the bowl you're collecting them in. I can't deny how pretty a big bowl of cherries is, steaming against a background of grass. My first haul of cherries resulted in many jars of cherry preserves crammed into the free space in our refrigerator. I got the recipe from Martha Stewart (disregard the notes about canning if you're making just enough to eat in two weeks). The only tweak I made was adding some Pomonas Pectin (1 tablespoon pectin combined w 1/4 cup sugar, 1/2 teaspoon citric acid dissolved in water) at the very end, right before I sealed it up in my mason jars. I like how thick the resulting preserves were, but it's totally up to you how you would like to make your jam. When you see "cherry preserves" in the recipe, refer back to Martha's recipe -- or use Bonne Maman cherry preserves (my favorite!). Tangy sweet cherry jam. Creamy, vanilla scented custard. A dense oat and almond crust. Preheat oven to 350F. Line a cupcake/muffin pan with parchment liners. In a food processor, grind oats into a powdery flour (about 2 minutes). Add almond meal and salt, and pulse to combine. While the blade is running, add maple syrup an coconut oil. Blend until it comes together and is thoroughly combined. Remove from food processor and form into a large ball. Pinch off about 2 tbsp of dough for each mini crust. Roll into small balls, about the size of golf balls, an flatten into discs. Fit to the bottom of each of your cupcake liners, pressing in. Bake crusts 15 minutes, until firm. Cool tin completely before filling with custard (I suggest refrigerating for at least 30 min). For the kefir custard: Add kefir, chèvre, maple syrup, honey, eggs, and vanilla bean seeds to the bowl of a food processor. Fill each cupcake liner almost to the top (leave at list 1 cm for the custards to rise). I suggest pouring your filling into a cup with a lip made for pouring first. I used a 2 cup measure. Bake 25-30 minutes, until the custard is set and just barely jiggles in the center. Cool completely, overnight if possible. Top with Sour Cherry Jam and garnish with a fresh cherry.